Gregg Davidson (left) and Stevie Cowan celebrating during Portadown's run of silverware across the early 1990s. Both players will be back at Shamrock Park this week for a special exhibition game. 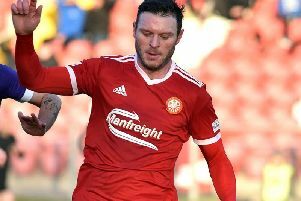 Portadown legend Stevie Cowan will step out on the Shamrock Park pitch this weekend for the first time in almost 25 years as part of an exhibition match against Glasgow Rangers. The Scottish striker is considered one of the most revered players in Ports history thanks to his role in landmark Irish League silverware during the early 1990s. Cowan and many of his former team-mates from those glory days will share a changing room again on Saturday before lining out to face a Rangers Select squad expected to include Marvin Andrews, Bobby Russell and John MacDonald. “Although I’ve been back in Portadown a few times over the years, this will be my first playing for the team at Shamrock Park since I left in 1993,” said Cowan, who will take to the pitch alongside past Ports such as Philip Major and Gregg Davidson. “I’m in my mid-50s now and the knees are worse than ever but it’s going to be a special occasion. “I’ve so many cherished memories, not just the success or even my team-mates but also the people around the club. Kick-off will be 5.30, with a ticket-only question-and-answer session in the MET Steel Stand clubrooms from 8 o’clock. Tickets remain available for ‘A Night Of Legends’ at Shamrock Park following the exhibition game. Contact Johnny Dunlop on 07967601941 for tickets to the ‘A Night Of Legends’. Admission to the match will be £10 and £5 (concession).